Can Cristiano Ronaldo score 30 Premier League goals this season? Fergie was forced to pay out on a friendly bet when Ronaldo broke the goal target set for him last season so the United manager has upped the anti by promising to raise the Portugeezerâ€™s not inconsiderable wages if he can score 30 league goals this year. Ronaldo has already surpassed the 23 goals that he scored in all competitions last year and has 17 Premier League goals to his name, despite Fergie recently admitting that he had no idea of the wingerâ€™s goal potential when he signed him. Heâ€™s still scoring freely with his firt hat trick against Newcastle recently and another brace in Unitedâ€™s last FA Cup game against Spurs. Heâ€™ll have a chance to add to his tally against Portsmouth tonight but to get a raise heâ€™ll have to score 13 more goals with only 15 league games to go. 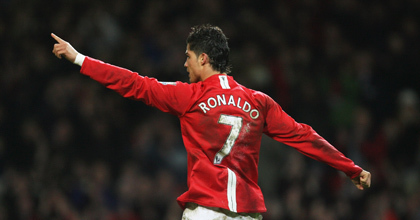 Let us know if you think Ronaldo can do it or if Fergieâ€™s money is safe.